Nevertheless the identification number TI-508 points to a handheld calculator, it could be called a "small desktop" machine. 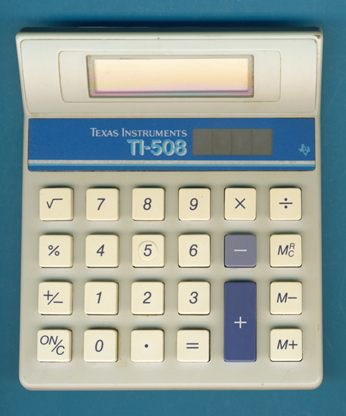 The calculator is based on the earlier TI-502. An identical calculator was sold as TI-1795, an identification number clearly borrowed from the desktop line. Production of the TI-508 and its twin TI-1795 was shifted in 1991 from Taiwan to Thailand, just before the slightly redesigned TI-508 PLUS was introduced. Don't miss the odd TI-808 and the TI-510.